Italicized directory names are the only ones you have any control over with respect to naming. The structure is fixed and may not be altered without destroying the integrity of the project. The directory specified as the project location when the project was created. Any directory may be chosen for the project location, but it is usually best to keep it close to the root directory (e.g. C:\ on Windows) to keep file paths short. The project directory created by the IDE to contain all of the projects files. The directory's name is simply the project's name with a ".X" appended. In most cases, this is where all of your source files and header files will be placed. You may also create subdirectories for them or place them in directories external to your project. Contains all of the intermediate files (*.o, *.o.d) generated by the compiler and/or assembler that are used by the linker to create the output files. The intermediate files are sorted by project configuration and then by debug versus production images. Contains all of the output files (*.elf, *.hex) generated by the linker. The output files are sorted by project configuration and then by debug versus production images. 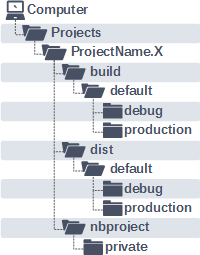 This directory (under both build and dist) contains files for the default project configuration. If you don't create any project configurations, this directory will be named default, otherwise there will be one or more directories at this level with the names of the project configurations you created. Contains files generated when the project was built in debug mode. Contains files generated when the project was built in release mode. Contains your project's settings, such as which files are included, which tools are selected, and so on. Contains project settings unique to your machine.